You can also get your RV weighed through Escapees RV Club. They have two full time facilities and also at many of their functions. A year or two ago I had a long discussion with a “big shot” at CAT Scales about weighing RVs. Their only objection I could determine was that they provide “certified” weight and they cannot certify a weight when part of the vehicle is off the scale. I can see no reason for this if they write “NOT A CERTIFIED WEIGHT” across the weight ticket. They still refuse. Whatever anyone might say there is no accurate way to weigh anything when part of the object being weighed is on one surface and part of that object is on another surface. Even the company that makes the scales used by companies such as RV Safety says on their website that it cannot be done. They are said to be the most accurate scales in the world – made in Switzerland. So can anyone get the powers-that-be in the RV industry to enter into discussions with CAT Scales to try to convince them to find a way to allow weighing of RVs so we can try to have vehicles out on the highway which are safer for all who use the highways? I would think that large RV outlets, such as Camping World, could do a profitable business supplying a scale service. 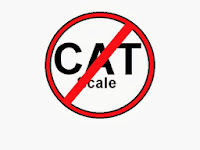 Does this mean that any CAT Scale which is still configured to allow enough room for offsetting the coach to obtain side to side weights will NOT guarantee their accuracy of the weights obtain using this method? Every time I read a story about RV weighing I wonder. Why don't RV service centers such as Camping World provide this type of service. Buying a single position scale can't be that expensive. Knowing axle weights without side to side information is much better than not knowing at all. Given the ease of access to CAT scales, the $12 to get a weight for your whole rig and a second weight of just your tow vehicle is a good investment. Certainly, I'll continue to look for a local scale that accommodates weighing each side independently. The problem with gravel pit etc. scales is that all that I have seen weigh the whole vehicle, not individual axles. Nor have I seen one that is setup such that you can weigh each side independently. At the first truck stop on the first trip next spring, I'll invest $10 and 10 minutes just to get quick axle weights of the whole rig. If I am not in a hurry, I'll invest the $2 and 20 minutes to unhook and weigh the tow vehicle separately. I will also try to get to one of the RV specific scales mentioned in the article and comments. Escapees Club in Congress, AZ weighs both front and rear axles as well as at each wheel, and also measures height.. Cost for me, a member was $41. I switched from towing to using a hitch carrier, but turns out I was 750 pounds overweight; I'm going back to using my tow vehicle which can also safely carry everything I had in the tote. I agree with the previous post, it would be a nice easy job for Camping World to buy one ( or two) scale plates and walk out to your rig and weigh it. It must be a money earner for them as I bet they could find something to sell you if you were over weight at any corner. Personally opinion - Camping World does not want potential buyers to know what RVs weigh. I wrote to CW and got no response. Any RV can be seriously overweight from side to side due to loading issues. Axle weight only tells you if an axle (or two) could be overweight but any RV could be seriously overweight on either side and you will never know it if you only get axle weight. As the above post stated - laws of physics - there is no accurate way to weigh any object with part of the weight on one surface or another. CAT knows this so will not guaranty the weight - nor should any other scale company that claims to be able to do this accurately since it cannot be done. The reason for weighing is to be able to get as close as possible to an accurate weight and do the best you can from there. It is extremely important that every RV be weighed in the approved manner - which is side to side. CAT could easily do this if someone could talk them into doing it in a way that was acceptable to all concerned. Since there is no accurate way to weigh there is no way anyone can claim to provide a "Certified" weight. Argument for CAT - when they weigh a truck, part of the truck is on one part of the scale and part is on another part of the scale. So one part of the object is on one surface and part is on another surface. Same as one part on ground and one part on the scale. Therefore this weight cannot be accurate either. Therefore they cannot claim "certified" for either method of weighing. It cannot be done. Ask them how??? Read the Haenni website above to understand this. As near as I can tell the Haenni scales used by police and RV weighing companies cost as much as $5,000 each. A minimum of two must be used. RV weighers have 6. There is a lot more to having Camping World start to weigh. Scale location must be level. Person weighing must know how. Having written to Camping World and receiving no reply I doubt they want to do it. When CAT used to do it we paid about $11 - the RV weighing companies charge much more. Their scales may be certified but the weights they provide cannot be certified because even the company that makes the scales says they cannot be accurate. I have weighed on CAT scales many times and they are as accurate as can be and as accurate as any other scale can be. But they will not certify a weight when part of the vehicle is off the scale. They may also be concerned that some drivers may not be able to carefully drive onto the scale with about a 3 foot apron without driving off the apron - or hitting something else. So it becomes more and more difficult for RVers to do something that is very important to do. Axle weighers: (Continued) Possible approval to authorize the acquisition of four Haenni WL101 Wheel Load portable axle scale weighers at a cost of $4,895 per unit for the Aberdeen Police Department. Budget amendment: (Continued) Possible approval of an amendment to the Aberdeen Police Department's budget in the amount of $19,580 for the purchase of weigher scales. I agree, knowing the axle weights is better than nothing. I weighed my motorhome fully loaded at a CAT scale and the axle weights were within my coaches specs. I looked at the location of my gas tank, water tank, holding tanks, refrigerator and battery's and found the weights were balanced fairly well. For the front tires I divided the axle weight by 2 and added 150 lbs to the battery side. The max load rating for my tires was 3525 lbs @ 110 psi. My max tire load was 2920 lbs, 83% of 3525. 83% of 110 psi = 91 psi. The rear tires were rated dual at 3000 lbs @ 95 psi. The max rear tire load each was 2600 lbs, 87% of 3000. 87% of 95 psi = 83 psi. Any formula that does not include the required corner weighing or side to side weighing or wheel weight on an RV is guessing or "assuming" and will not tell you if you are overloading any component of the vehicle. Weighing is important not just to determine tire pressure but to determine if you have overloaded any component of the vehicle - axle - spring - brakes - wheels - any part of the suspension. An out of balance vehicle can have serious handling problems and overloaded components can wear out or break faster. Axle weighing is a guess and guesses can be dangerous. Yes, axle weighing is better than nothing but you are still assuming. Hi, this is Dave, from Fifth Wheel St. Hopefully; I can clarify some information here. Firstly, I recommend reading this article, Truck Scale Accuracy - A Weighty Issue Revealed at http://goo.gl/ovXvRm. Second, it is true that it’s practically impossible to obtain accurate individual wheel position weight at just about all truck scales. The adjacent surrounding surfaces MUST be level with the scale. I have yet to see any truck scale meeting that qualification. Third, CAT Scale is solely designed for the commercial trucking industry. That is there bread and butter business priority. I was informed by one of the headquarters’ staff employees that RVIA has discouraged them from promoting RV weighing. The reason being is that CAT Scale is not setup for individual wheel position weighing. Fourth, as mentioned, the initial investment for weighing RVs can easily exceed $30,000 for the cost of 6 scales, training, and a computer system with software. Then there’s the cost of labor. That’s a significant investment for something that is not required by law. It would not be a profitable business for Camping World to weigh RVs. I’ve told others in the past, if it became a legal requirement to weigh RVs, I’d start franchising in a heartbeat. In the mean time and at the very least, weigh your RV at a local truck scale while you wait for a convenient RV weighing provider. I would like to point out that we are not trying to get weights accurate to the nearest pound or even nearest 100 pounds. This makes no sense when you look at the load capacity when you change your inflation by 5 psi. Also considering the accuracy of most gauges would translate to a theoretical load capacity variation of more than 100#. We want to identify the gross difference in side to side loads. This is not rocket science. Don't measure with a micrometer when you are cutting with an ax. Make a reasonable effort and you should be able to know when you are way out of line. For anyone traveling in the West and Pacific Northwest I have often found state/provincial highway scales were left on even when the weigh station is closed, so you can pull up and check your weight. I know for sure this is the case in British Columbia and Nevada, and if memory serves, also in Washington and Oregon (one of the two for sure, just don't remember which one). It's easy to see: if the weight display by the scale is on, the scale has been left on but unattended. I have found almost all of these scales are on a flat, level piece of pavement that easily allows jockeying back and forth to get axle weight and weight of only one side to figure out your individual wheel weights. Don't know if this applies in any other states or provinces, but it's allowed me to weigh regularly whenever I travel through these states & provinces.